1926 – Robert Goddard became the first man to launch liquid-fueled rocket. The liquid oxygen and gasoline mixture launched the 10 foot rocket, travelling at 60 MPH, to an altitude of 41 feet. 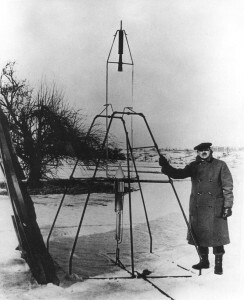 The rocket was dubbed “Nell” and was launched in the cold climate in Auburn Massachusetts. The New York Times picked up on Goddard’s experiment, but wasn’t kind to him. They denounced his work, ultimately swaying public opinion. An unwavered Goddard put together a team and in 1930 continued his research. He made some great strides until 1945 when he passed away. His work and 214 patents gave way for scientists to continue the research and eventually send astronauts to the moon. On July 1969, The New York Times retracted the 1926 article, giving him proper credit as the father of modern rocketry. 649 episodes available. A new episode about every 23 hours averaging 6 mins duration .